Australia has long had one of the most monopolised media industries in the world. Indeed, when Green Left Weekly was launched in 1991, one of our key slogans was “Break the media monopoly — support Green Left Weekly”. Today it is even more relevant. The Community and Public Sector Union (CPSU) has called on federal MPs and senators to reject new legislation tabled by federal Communications Minister Mitch Fifield, which is aimed at further undermining the independence and integrity of the national broadcasters ABC and SBS. Foreign Correspondent’s “Venezuela: A nation on the brink”, screened on the ABC on March 21 was a straight out piece of US State Department propaganda. It was also more evidence of the ABC’s rightward trajectory under ex-Murdoch executive and CEO Michelle Guthrie. “Venezuela is a disaster,” reporter Eric Campbell and producer Matt Davis begin. “It has the biggest oil reserves on the planet. But instead of living like Middle Eastern sheiks, many Venezuelans are on the brink of famine. Last week the ABC broadcast Recognition: Yes or No?, a program following the joint travels of federal Labor MP Linda Burney and conservative commentator Andrew Bolt as they debate whether Indigenous peoples should be “recognised” in Australia’s Constitution. In May, the ABC's first female managing director Michelle Guthrie was introduced by the ABC Board as bringing “business expertise, international contacts, a record in content-making across an array of platforms, a deep understanding of audience needs and corporate responsibility for promoting issues like diversity”. About 70 people, mainly from the Australian Kurdish Association, organised a peaceful protest inside and outside the ABC Ultimo Centre on January 14. They were protesting against the national broadcaster's bias and slander against the Kurds, despite the Turkish government's attacks on Kurdish areas in Turkey and Syria. It has become a disturbing hallmark of the current government that the degree to which Prime Minister Tony Abbott adopts the style of a Nazi leader addressing the Nuremburg Rally is a reflection of the policies being foreshadowed. 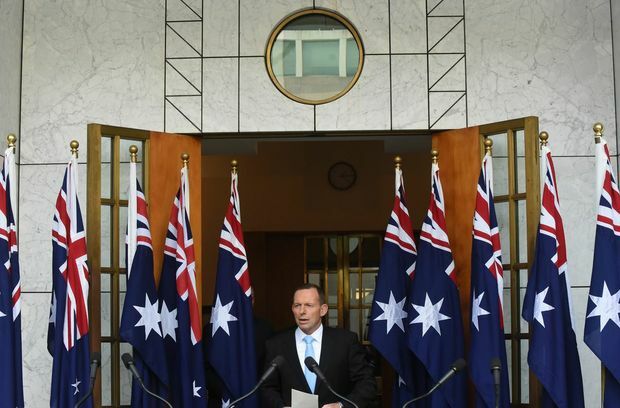 At Abbott's June 23 press conference, the flag count was up to 10. The parliamentary sitting week that followed was an assault on democratic rights. In the third attack on the ABC by a government minister in the last month, Defence Minister David Johnston said on February 7 that reports that asylum seekers had their hands burned by navy personnel warrants an investigation into the national broadcaster. "If ever there was an event that justified a detailed inquiry, some reform, an investigation of the ABC, this event is it," he said. This follows comments by Prime Minister Tony Abbott on January 29 when he said the ABC “appears to take everyone’s side but Australia’s and I think it is a problem”. Media crisis: Is Aunty an ally? Amidst the ongoing discussion about Fairfax, Gina Rinehart and the “crisis of journalism”, the ABC celebrated its 80th anniversary on July 1. As Fairfax and News Limited cut newsrooms and erect paywalls the ABC is expanding its online and broadcast news presence.